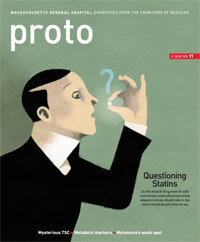 Proto readers defend the safety of statins, discuss the importance of recognizing addiction and applaud the efforts of researchers studying TSC and LAM. “Change of Heart?” (Winter 2011) misstates potential side effects of these drugs. First, myopathy is not the most frequent side effect of statins; rather, it is myalgia, a nonspecific muscle pain or soreness that typically disappears within a few weeks after a patient stops taking statins. Myopathy—actual muscle disease—is rare, occurring in approximately 1 in 10,000 patients. More-over, the assertions that statins induce cognitive problems and permanent muscle damage are derived from isolated case reports and have not been validated in controlled trials. Neither have the hypothesized associations between statin therapy, suicide and violent behavior been shown to bear weight. Let’s suppose a serious illness affected 8% or more of the U.S. population and caused 2.1 million emergency room visits in 2009. Despite this apparent epidemic, most U.S. medical schools devote no more than a few days of training to this illness, and most patients admitted to the hospital with the problem never receive a diagnosis. The illness is addiction. It’s a problem Kathy Nickerson described in her essay “Occupational Hazard” (Winter 2011)—her husband, a doctor himself, went undiagnosed despite constant contact with other health professionals—and it underscores that American medicine has largely stayed on the sidelines of the battle against substance abuse. Finally, that should change, now that the federal government has enlisted our nation’s health care system to help diagnose, intervene in and treat drug abuse. The government program, called Screening, Brief Intervention, and Referral to Treatment, screens and provides brief interventions in hospitals, primary care settings, colleges and even one tribal council. As of February 2008, more than 605,000 patients had been screened, with more than 22% screening positive for drugs. Of these, 16% received a brief intervention, and six-month follow-ups showed significant declines in substance abuse. Gregory E. Skipper // Fellow, American Society of Addiction Medicine, Montgomery, Ala.
It’s a thrilling time to be studying tuberous sclerosis complex and lymphangioleiomyomatosis, which, as your Winter 2011 story (“Full-Body Peril”) describes, are debilitating diseases characterized by benign tumor growth in vital organs. In 2002, after researchers discovered that the Akt/mTOR pathway is implicated in these diseases, scientists immediately recognized the importance of this discovery: mTOR can be blocked effectively by the drug rapamycin, which was already in use as an immunosuppressant. Clinical trials quickly commenced and established that this drug can block TSC and LAM tumor growth. Very rarely do single-gene disorders make it from gene discovery to clinical trials within a decade, as TSC and LAM did with rapamycin. This would be impossible without the active participation of patient organizations that donated tissue samples, raised research funds, and encouraged scientists and physicians. Because rapamycin does not cure TSC or LAM, the search continues for other drugs. Joseph Vacanti has already engineered skin and bone, but what he really hopes is to grow whole, functional organs.